Chuck Parker collected the event victory in the Redemption series exhibition eliminator, which features a wide variety of no-prep-style cars, during Friday qualifying at the AAA Texas NHRA Fall Nationals at Texas Motorplex. The Redemption series’ small-tire cars were a featured exhibition at the Houston race earlier this season, but this time around it was the big-tire cars. Tucson Dragway, the Arizona No Prop Association, and Scoggin-Dickey all contributed to the exhibition. 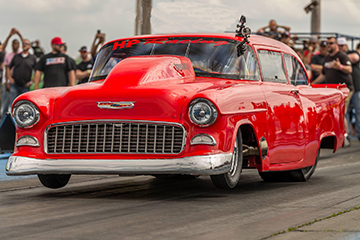 Parker, wheeling his nitrous-assisted '55 Chevy, dubbed “Jolene,” took an easy final-round win when Frankie "Mad Man” Taylor’s supercharged Firebird broke just off the line in the final round. In the opening round, Parker drove around the four-hundredths holeshot of Street Outlaws star “Doc” Love and his nitrous-fed “Street Beast” Monte Carlo entry to win handily, then beat heavily-favored Kayla Morton in the semifinals when her Hot Mess Express Procharger-equipped Mustang faltered early in the run. Taylor reached the final round with a first-round victory against Larry Baker and his turbocharged ‘62 Chevy then moved ahead after Mike Henson rolled the beams and fouled in his twin turbo Corvette in the semifinals. The Fuel injection, Ignition and Nitrous systems are all controlled by the EFI Technology R8 ECU.